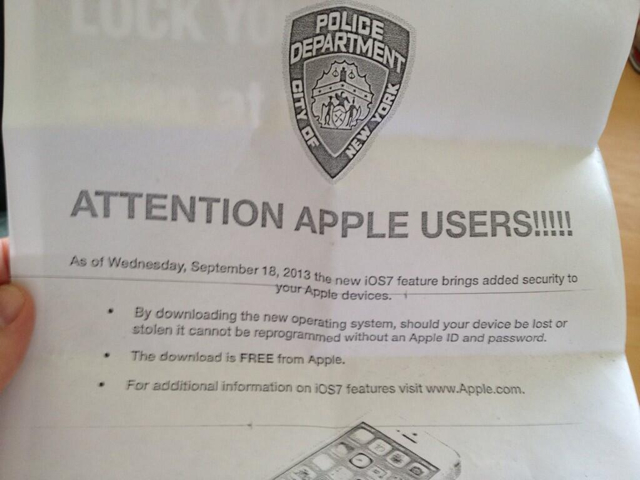 New York City police officers are handing out fliers asking Apple users to upgrade their iPhone, iPad, and iPod touch devices to iOS 7, reports AllThingsD. A new iPhone model also means a probable uptick in attempts to steal them. And since Friday’s launch of the iPhone 5s and 5c also happens to coincide with the launch of Apple’s iOS 7, which has some new security measures intended to deter theft, New York’s finest and other police agencies around the U.S. are making an effort to get people to download it. As of Wednesday, September 18, 2013 the new iOS 7 feature brings added security to your Apple devices. ● By downloading the new operating system, should your device be lost or stolen it cannot be reporgrammed without an Apple ID and password. ● The download is FREE from Apple. ● For additional information on iOS 7 features visit www.Apple.com. The NYPD has also been posting to Facebook groups and encouraging parents and other users to upgrade their devices. Check out the handouts below!